The Terminal defaults to being a bunch of boring black on white text, and sure you can change the appearance to other themes, add colors, background images, opacity, transparencies, and other UI customizations, but what you really want is obviously a rainbow version of the cat command for input and output, right? Right, of course you want rainbow output, who wouldn’t want that? 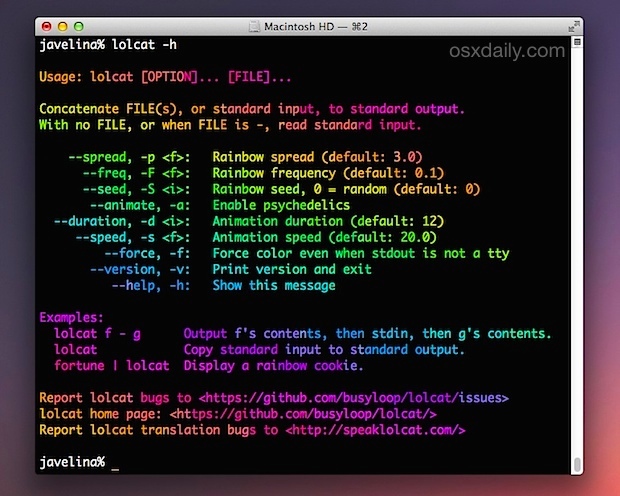 That’s where the lolcat command line utility comes in, because lolcat is a concatenate utility that can serve as a very colorful cat replacement, or take any standard input and dump the output as a rainbow of text. Is this useful? Well, that’s up to you to decide, but it sure is fun and more lively looking. Note: in case it wasn’t obvious yet, this is kind of a joke, but lolcat legitimately does work as a functioning cat replacement. Because this is entirely contained within the command line, it’s best reserved for advanced users who are comfortable using Terminal… and who want rainbow output. Installing should only take a minute or two to complete. You’ll then see the most colorful help text ever made. If you want some extra amazement, the -a flag is particularly exciting because it creates an animated rainbow effect of cycling colors, which is basically the peak of human innovation. 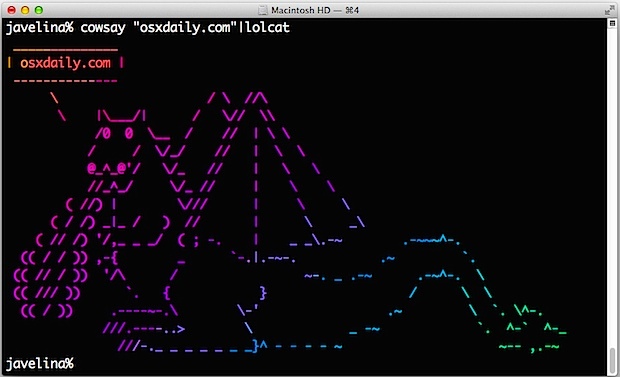 The lolcat utility is open source, those interested can view the project page on github. Can’t get the command ‘echo |lolcat -a -d 500’ to work. The return is three question marks. If I use ‘sudo echo …’ then those question marks are displayed in red. The lolcat help file is displayed in a rainbow version. Yes, you can make text size bigger in Terminal, just hit Command + Plus keys a few times to increase font sizes in Terminal! Here is an article detailing more about increasing test size of Terminal via keystrokes, but you can also do it in the app Preferences if you prefer. after entering the sudo gem install lolcat – it asks for a password..? what is it?